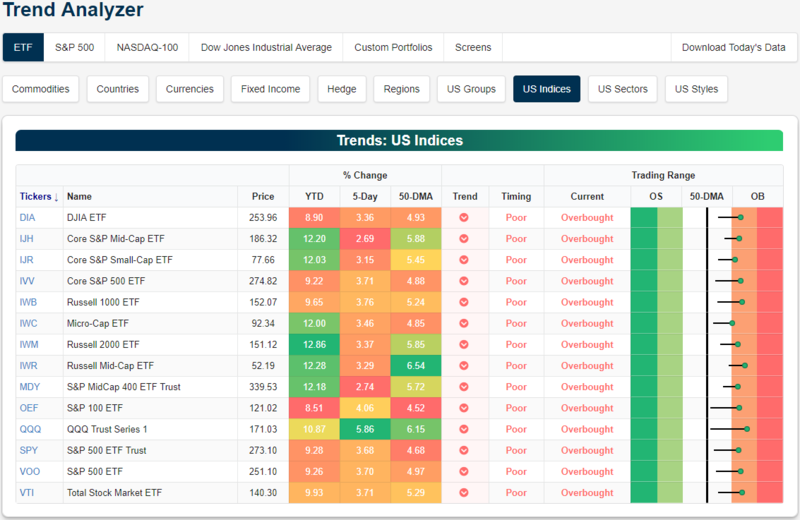 It has finally happened: every one of the 14 major index ETFs are now reading overbought in our Trend Analyzer tool. The indices vary in the degree of how overbought they are with some firmly overbought like the Nasdaq (QQQ) while others are still pretty close to neutral like the Micro-Cap (IWC). At this time last week, none of the ETFs in this group had yet to move out of their neutral trading range. Some have even rallied from levels just above their 50-DMA. The Nasdaq is actually one of these names making big changes in a short span of time. QQQ has been surging in the past week, rising 5.86%. These gains have brought QQQ to the highest overbought levels out of these ETFs. QQQ has been greatly outperforming the other ETFs. The next best is the S&P 100 (OEF) seeing 4.06% gains over the past five days. Despite these more positive signs, each ETF has still yet to move out of its long-term downtrend and timing is now poor because of that.